It's March, and once again we headed to the Weasku Inn, the charming and historic Grants Pass resort resting beside the Rogue River. Built in 1924, the Inn claims such famous past visitors as Clark Gable, Carol Lombard, Bing Crosby and Walt Disney. In fact, come to think of it, I may have even caught a glimpse of Carol flittering up the stairway as we entered the front door on Sunday. This year we took along a bag of reading material, including Strange Shores (the latest mystery by our favorite Icelandic author, Arnaldur Indridason), rain gear, mushroom collection baskets, and walking sticks. We had thus fully armed ourselves with the expectation of enjoyment inside the cabin (if the weather turned too frightful) as well as outside the lodging. Both of us were looking forward to gathering Verpa bohemica (sometimes called the "early morel", or more properly, the "false morel") and/or Morchella (sometimes referred to as the "true morel"). The day was a little drizzly. Then, suddenly, the rainy weather pattern broke, and the afternoon was fine. We set aside our reading material and headed out on our foray. By habit, we sought out an area where cottonwoods (and the related poplars) were prevalent. Our experience is that the first of the year's mushrooms can typically be found in areas dominated by these tall, decidous trees. When we've hunted Verpa along the Columbia River, we've also found a multitude of newly birthed snakes ... which for some of us greatly diminishes the mushrooming experience. But I digress. In Grants Pass we homed in on the Rogue River Greenway Trail, the section running from the Depot Street Bridge Portal into the Valley of the Rogue State Park. Well, actually, it was only me on the paved walkway; the more adventurous Steven chose to abandon the convenience of the walkway for the adventure of bushwhacking his way thru the brambles and cottonwoods. Happily, both of us encountered an abundance of the sticky, yellowish, resinous seed pod cases dropped by the cottonwoods and scattered over the ground. Another digression and a word of caution! If you're unfamiliar with these pods, be aware that they stick to everything and anything, leaving a stain that's hard to remove, although rubbing alcohol can usually help in the effort. In spite of our enthusiasm, there wasn't a Verpa bohemica to be found. I suspect we were simply too early. What we did find as we scoured the landscape under the cottonwoods were magnificent patches of Coprinus comatus, or "shaggy manes" as they are more usually known. They were seemingly everywhere: along the river, along the highway, anywhere there were cottonwoods in the vicinity. By and large, the mushrooms were very substantial in size and weight, newly fruited and excellent specimens to be captured by Steven's camera! Like more information about shaggy manes? 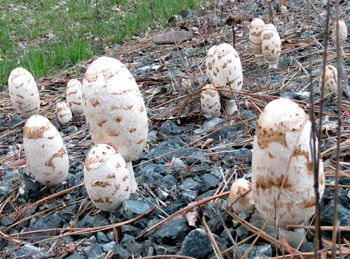 You may wish to read Shaggy Manes 101 on this website. There were 19 shaggy manes in this cluster! March, 2014's Recipe of the Month: Roxanne Chan's "Winter Wilted Shiitake Salad"
Roxanne Chan's eye-pleasing Winter Wilted Shiitake Salad was the first recipe that the judges sampled when we started evaluating the entries in this year's recipe contest ... and it remained a favorite throughout the selection process. And, why not? It has everything: it's easy to assemble, is a bonanza of textures and colors, is wholesome and fresh tasting, and would be a delight to feature on any dining table. Roxanne confesses that she's no newcomer to recipe contests. She's been creating recipes and entering amateur competitions for almost 35 years. She likes to introduce Asian flavors into preparations. Salads, such as the Winter Wilted Shiitake Salad, are the favorite category of recipe for her to develop, thanks in large part to the inspiration provided by her garden in Albany, California, on the eastern shore of San Francisco Bay. 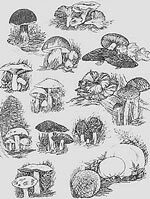 Roxanne's husband is also an inspiration for her recipes: he's a mushroom forager, and she delights in incorporating his discoveries into her food preparations. What a great partnership and recipe! 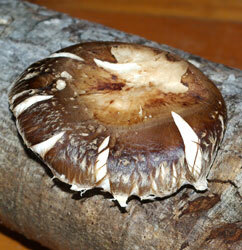 and then wait 6-12 months for these meaty mushrooms to fruit!